Hello World Wide Wed of Beautiful People!!! What is Friday favorites you ask? Basically, I just talk about two random things that keep me sane through the week, and the new stuff I just added to my everyday life. Favorite Songs: Music is a huge part in my life. My grandmother was a choir director and my mother was the assistant director. So naturally I was drawn to music, singing, and wanting to know how to play every instrument. (Just to clarify, I don’t play every instrument; but that’s the goal) My music and the songs I listen to are based off on how well I can relate or if it’s just a generally nice raw song. 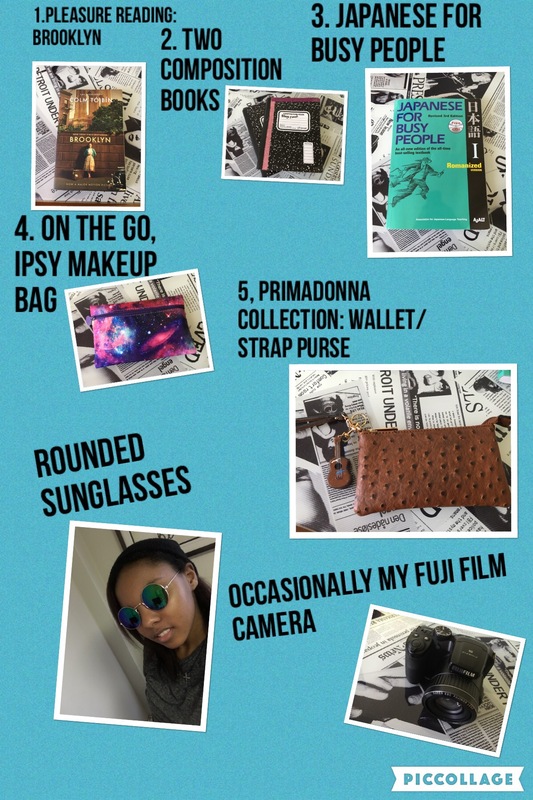 Favorite book bag essentials: I don’t usually carry around a purse as often as I used to. Mainly because I am a lot busier now. for instance I am babysitting, to help get a new computer for my blog. Also on Mondays I have a one on one Japanese lesson with my dad . Plus I’m going to start volunteering through red-cross at the library soon. So, carrying a purse just doesn’t do the job a book bag can. I typically use purses for when I’m going out to dinner or a party. Anyway………… This bag is the love of my life. My partners in crime. We never go anywhere without each other. I got this owl print book bag at an Italian market. Which is where I got most of my Italian wardrobe from. It actually looks small but it carries everything I need, from a Japanese handbook to my Ipsy makeup bag. Check it out here below. This was the first of many Friday favorites. Comment below what you would like to see me post about next Friday. Thanks for reading and feel to Follow my blog with Bloglovin . Make sure to follow me on Twitter(@mimifry15) and on Instagram(@_almostmia).